The nearly mature or mature fruit of Piper nigrum L. of family Piper. Hainan, Guangdong and Yunnan provinces in China. Collected in the period of autumn to the spring of the next year, when the fruits turn into dark-green, collected and dried in the sun, it is called Hei Hu Jiao, when the fruits turn into red, collected and dipped in water for some days, then scraped off the pericarp and dried in the sun, it is called Bai Hu Jiao. Big, massy and aromatic, pungent. Pungent, hot; stomach and large intestine meridians entered. Warm middle energizer to alleviate pain. It has the actions of warming middle-energizer and dispersing cold to alleviate pain. 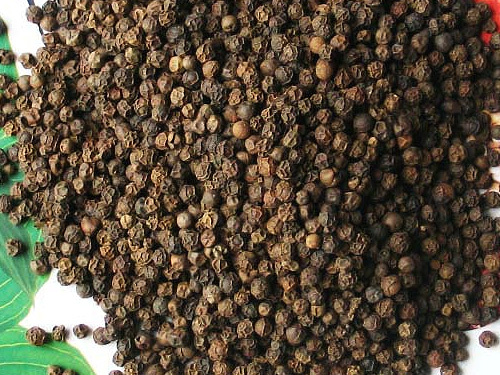 For stomach cold, abdominal cold pain and vomiting, it can be ground into powder and braised with pig stomach for oral use, or combined with the middle-energizer-warming analgesics such as Gao Liang Jiang and Bi Bo. For regurgitation and poor appetite, it is usually combined with the phlegm-resolving and appetite-increasing herbs. For instance it is combined with Ban Xia and juice of Sheng Jiang in Bai Yi Xuan Fang (Precisely-selected Prescriptions). For diarrhea due to deficiency-cold of spleen-stomach, it is combined with the spleen-invigorating, damp-drying and diarrhea-checking herbs such as Bai Zhu and Wu Zhu Yu. In addition, it can direct qi downward resolve phlegm. 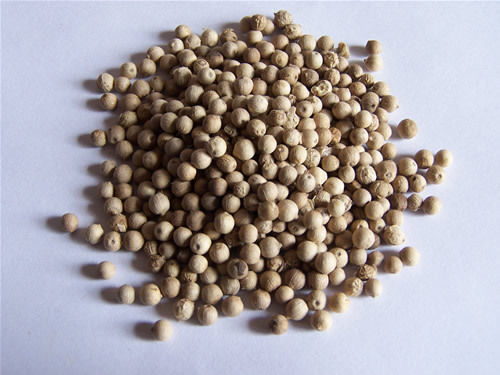 For epilepsy with profuse phlegm, it is usually ground into powder with Bi Bo for oral use. It also can increase appetite and be used as condiment. Decoct 2~4g; 0.6~1.5g powder for oral use. Proper dosage is for external application.